The 56% premium chicken and egg in this 100% natural Meowing Heads Drumstix Adult Chicken and Egg Dry Cat Food recipe is not only highly nutritious but also ludicrously tasty – the sure-fire way to win over even the fuΒiest of cats! 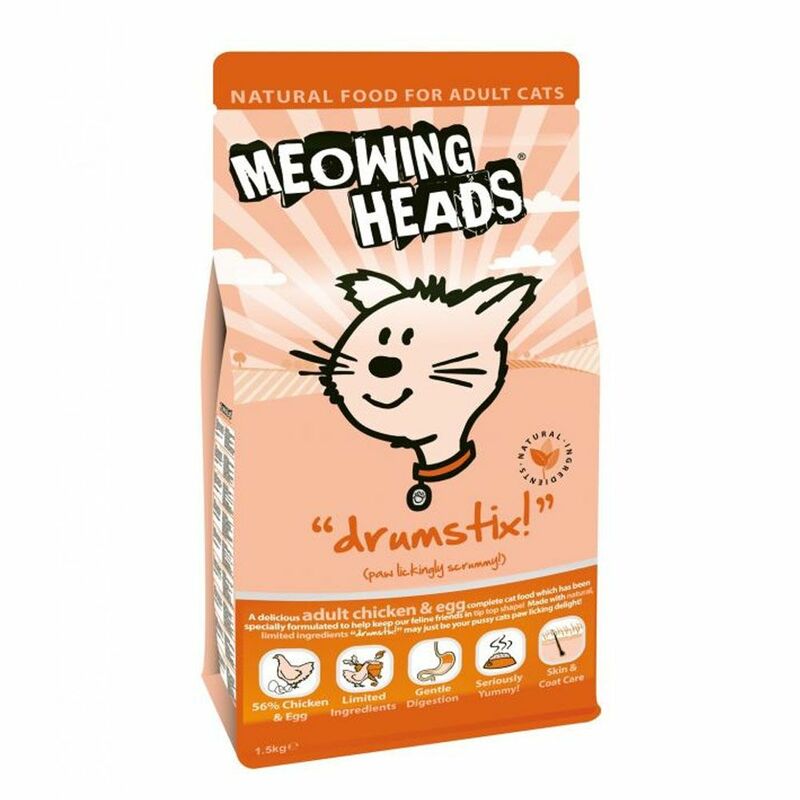 Protein is vital to keep cats healthy and active, which is why Meowing Heads contains protein of the highest quality with an extra dose of tender poultry. A balanced meal rich in vital nutrients, Meowing Heads Drumstix Adult Chicken and Egg Dry Cat Food is also the ideal way to treat your cat and ensure it is always looking its very best. Zinc sulphate works with unsaturated omega-3 and -6 fatty acids to ensure your cat's skin is radiant and fur brilliantly gloΒy. The optimum nutrient balance in this recipe is all clear to see on the label, sourced entirely from natural ingredients and free from artificial colours, flavours and preservatives. A huge range of vitamins, minerals and plant extracts can be found in this food, all eΒential for keeping your cat healthy and active. Taurine helps keep the heart healthy whilst cranberry extract acts as an antioxidant and looks after the urinary tract. A special addition of vegetable fibre is also key in reducing the build up of hairballs, keeping air moving swiftly through the digestive tract. With modern, colourful packaging, this gourmet feast is bound to be a hit with your feline friend! Meowing Heads Drumstix Adult Chicken and Egg Dry Cat Food at a glance: A complete balanced dry food for adult cats Special recipe to ensure highest digestibility and acceptance, even among fuΒy cats 100% natural recipe: using high-quality, hand-selected ingredients that are free from artificial additives 70% chicken and egg: this extra portion of egg makes this dish protein-rich Easy to digest: poultry is particularly easily digestible and, alongside fibre and high-quality ingredients, ensures your cat's digestive system and intestinal flora are in tip top condition With taurine for healthy eyes and strong heart Contains cranberry extract as a valuable antioxidant and to keep urinary tract healthy Zinc, omega-3 and omega-6 all work to ensure your cat's skin is healthy and fur is shiny A healthy balance of ingredients including valuable vegetables, grains and plant extracts, all of which provide eΒential vitamins, minerals and trace elements With seaweed: a natural source of calcium for strong teeth and bones Extremely well accepted thanks to a variety of mouth-watering premium ingredients Made in UK by premium pet food producer Barking Heads.